People give feedback on a daily basis. It can be either positive or negative but people know that feedback is essential.The point of providing efficient feedback is to give someone information that he or she can use to grow and improve. This is especially important for businesses as they need the information to help them out. Let’s say that a business would like to find out the level of satisfaction that their customers are experiencing. So the one thing they do is to have these customers answer surveys which will let them find out what they need to know. Feedback can be given anytime at anyplace. No matter what kind of company you work for, or whatever establishment you’re involved with, you will always hear feedback. So whether it’s an employee appraisal or a review of a presentation, one must remember that feedback will always be given. Feedback is effective in helping one understand. Whether you’re handing it out verbally or making use of forms, providing feedback will essentially tell someone everything that he or she needs to hear that could help. So remember that the next time you hand feedback to someone, the aim is to help that person develop into someone that can achieve success. Feedback can help improve one’s performance. This is especially true if one were to make use of documents such as performance feedback forms. If you tell the person that he or she is doing really well in terms of performance, then that person will know what to keep consistent for more positive reviews. If you tell that person that there are problems in terms of performance, then you can go into detail as to what these problems are and help find the solution as to how the problems can be solved. Feedback is an essential tool for improvement. By being able to learn more about one’s self or other parts of the company that’s either doing well or doing poorly, it will definitely ensure that an entire business sees gradual improvement. This is because obtaining feedback can help people create new marketing strategies, develop new products and services, or build up skills and knowledge that could be very helpful as they continue to grow. Feedback can make someone feel positive. If you were to gather all customer feedback and implement some of the suggestions that they have made, then customers will know that they have been heard which will make them feel valued. Feedback can also be used to make employees feel happy by giving them positive feedback about what they have done right. It is very important to tell them what they have done right to make sure they know why they’re being praised. Interview Feedback Forms. These are the kind of forms that are utilized by employers for when they have to tell applicants how they performed during an interview. 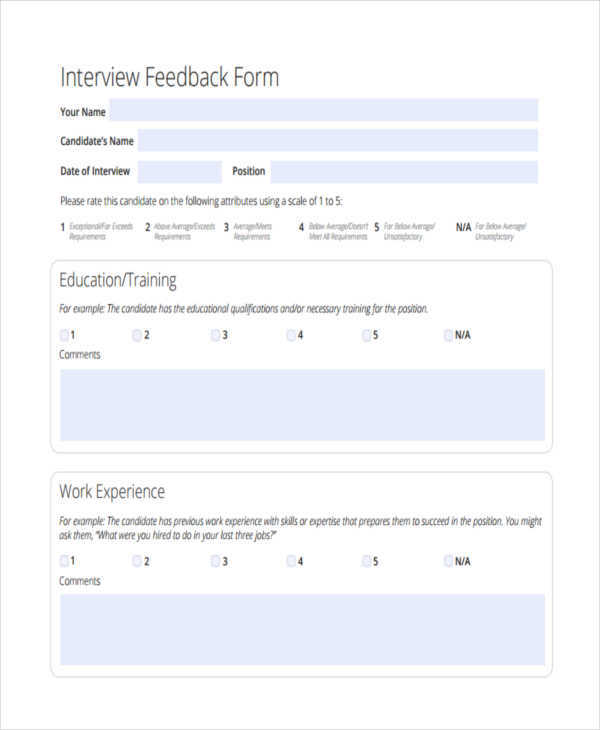 Interview feedback forms help them assess parts of the interview such as how the interviewee was able to answer certain questions, whether or not the interviewee was able to meet all the necessary qualifications, if the interviewee showed any signs of nervousness and so on. This is used to help employers determine if a candidate for employment should be hired or not. 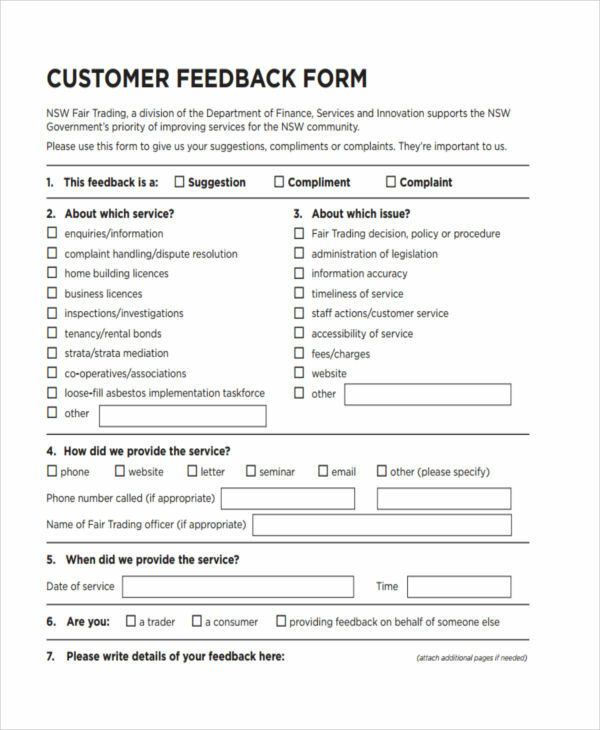 Customer Feedback Forms. These are made use of by just about every business. 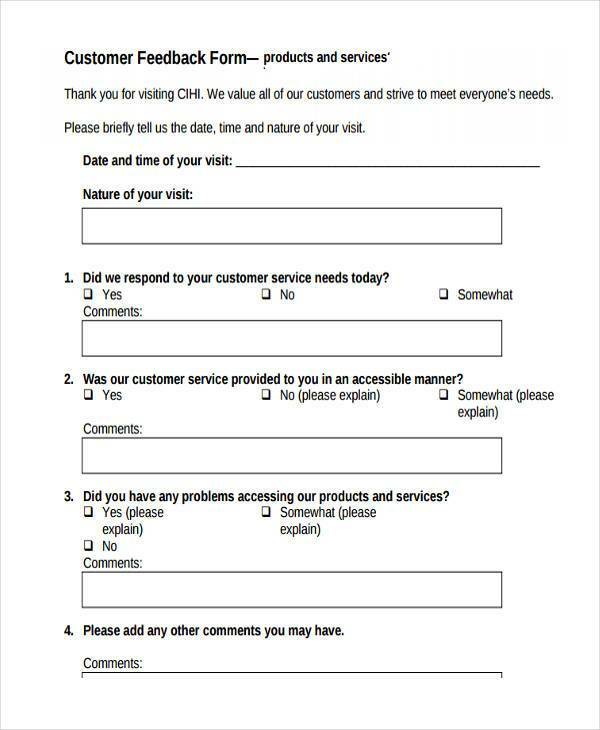 Customer feedback forms are documents that are handed out to customers either via physical copies or through e-mail which contains certain questions that ask customers how they feel about the certain aspects of a particular company. So it can be anything from a company’s products, services, facilities, or even the employees. This tells these companies on what needs to be improved, as well as what should be changed or even remove to ensure that the customers will have a better experience. Training Feedback Forms. These are made use by participants of any training sessions wherein they are able to assess different parts of what they took part in. So it can be anything from assessing the training sessions for would-be teachers, facilitators, gym instructors and more. The results of these are especially beneficial to those who are holding the training programs or sessions as they are able to gather important information as to which parts of the training were good, or if their methods of teaching these people were of any use at all. 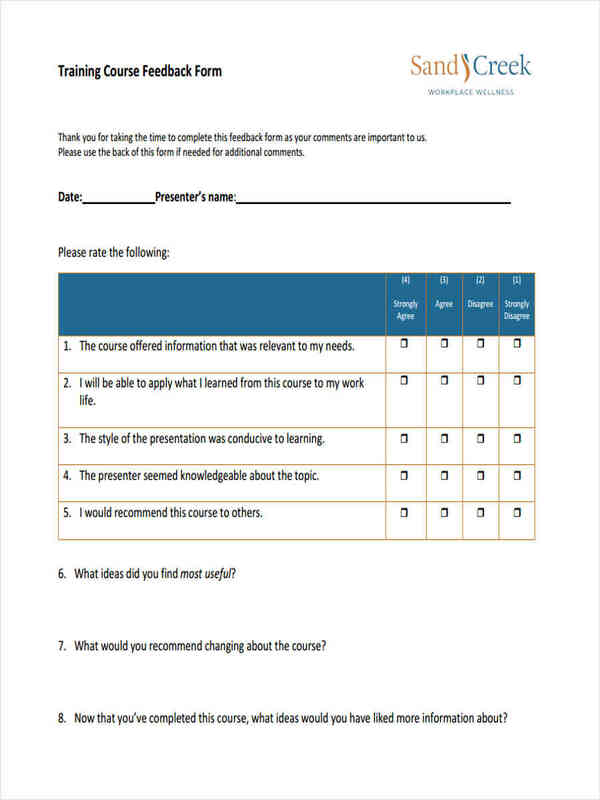 Presentation Feedback Forms. 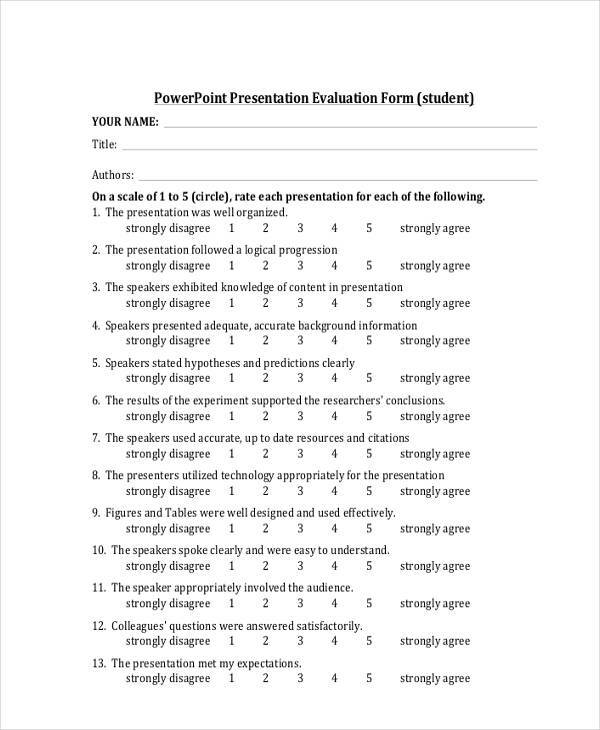 These are forms that teachers or supervisors use in the event that they have to assess any kind of presentation. There are many factors that determines as to whether or not the point of a presentation was able to get across to the audience. So presentation feedback forms look into these different factors such as the presenter’s communication skills, the visual aids being presented, the amount of research done on the topic and more. Whether it’s positive or negative, this allows the evaluator to give sound advice that can help presenters provide quality presentations in the future. 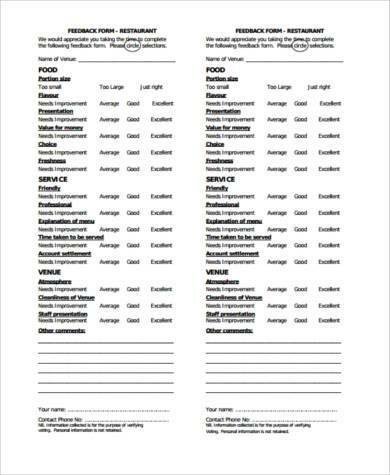 Restaurant Feedback Forms. These are given to every person who have decided to dine in any restaurant of their choosing. What these forms do is allow the customer to rate their dining experience from beginning until the end. So everything from the ambiance of the establishment, the performance of the server, the food that was provided, the time it took to prepare the food and so on. 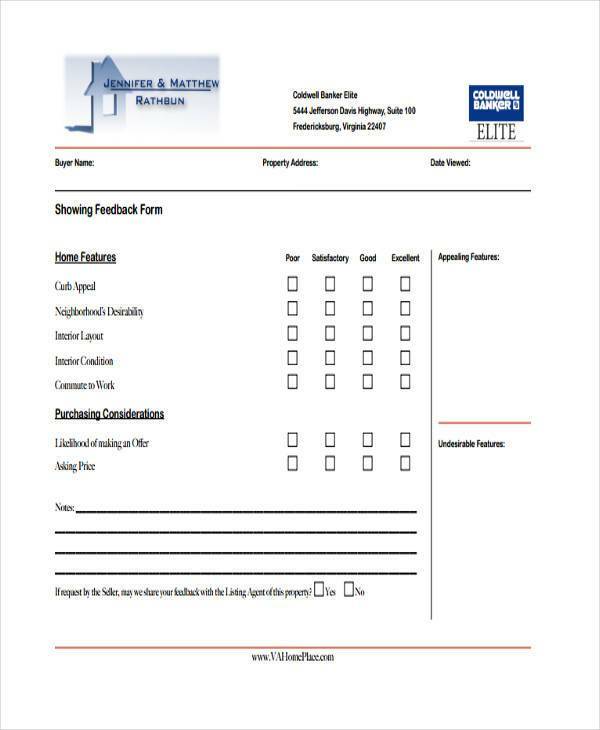 With restaurant feedback forms, customers are able to show if they have had a pleasant experience, or if they think they won’t be coming back and are better off finding better restaurants. Event Feedback Forms. These are essential for every event organizer if they want to know just how successful their event has gone. 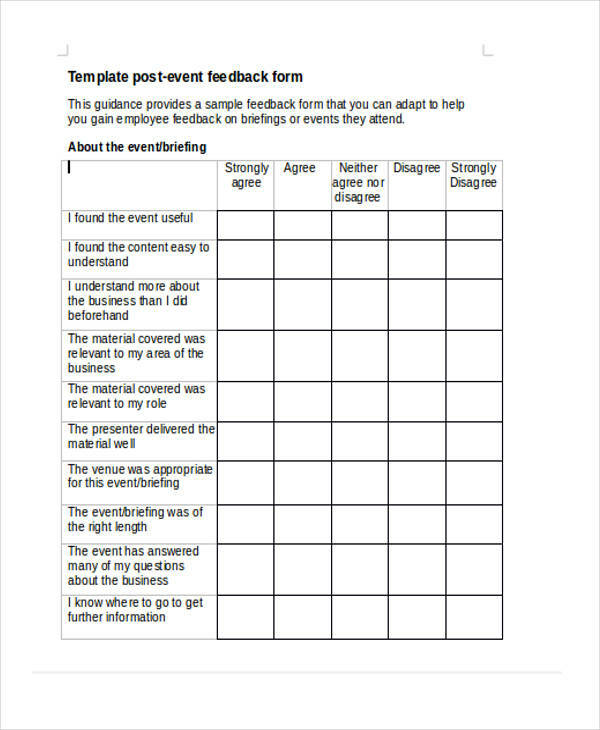 No matter what type of event it is, whether it’s a volunteer program, a social gathering, or even a concert, event feedback forms will provide organizers with the information they need to know to see how their participants rated their event. Participants can rate things such as the speakers of the event, the food, the location, the programs and anything else about the event that the participants experienced. Hotel Feedback Forms. These forms are what any hotel guests use to show how satisfied they are with their stay. 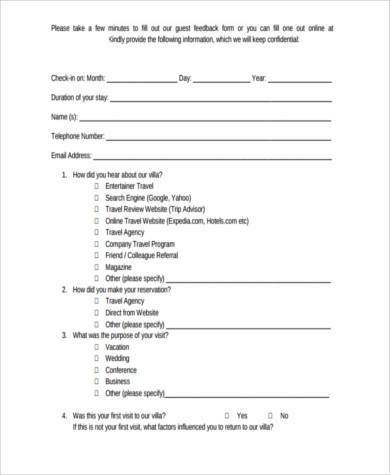 Hotel guests may use these forms to show hotel management how they felt about their stay. This information can help these hotel managers determine which parts need to looked into immediately should the hotel guests have any complaints about their stay. Doing so can help ensure that future guests have a much better experience, as well as improving the image of the hotel. State the positives. It’s important to point out what the person did right, doing so will help that person feel motivated to and in turn making sure that he or she will still end up being more productive. Be specific with what you need to point out. If that person did a good job, then you will have to state how that person did a good job and not just say “You did really well”. Be specific by handing out a proper explanation as to what the employee was able to achieve, this also shows that you have been monitoring that person. When pointing out problems, be firm but not mean. If you’re going to point out the negatives, don’t do so in a way that will undermine the receiver, but instead show that you are trying to make that person see the errors that he or she has commuted. And remember to always do so in a respectful and professional manner. Always provide a solution or a suggestion to help that person fix certain problems or attain specific goals. This will show the receiver that you care about his or her success. Be up to date and do follow-ups. After you have provided feedback, keep track of the person’s progress to see whether or not he or she has listened to your advice and suggestions. You must then do a follow-up to see if that person was able to take your feedback to heart, and changed whatever needed to be changed.